This article is 3171 days old. 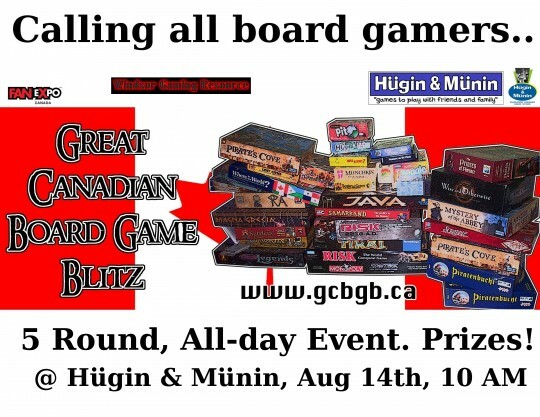 The Windsor Gaming Resource, a online community for gamers in Windsor/Essex and Hugin & Munin, a popular Windsor store dedicated to gaming of all types are together hosting a special Board Game Blitz event this Saturday. 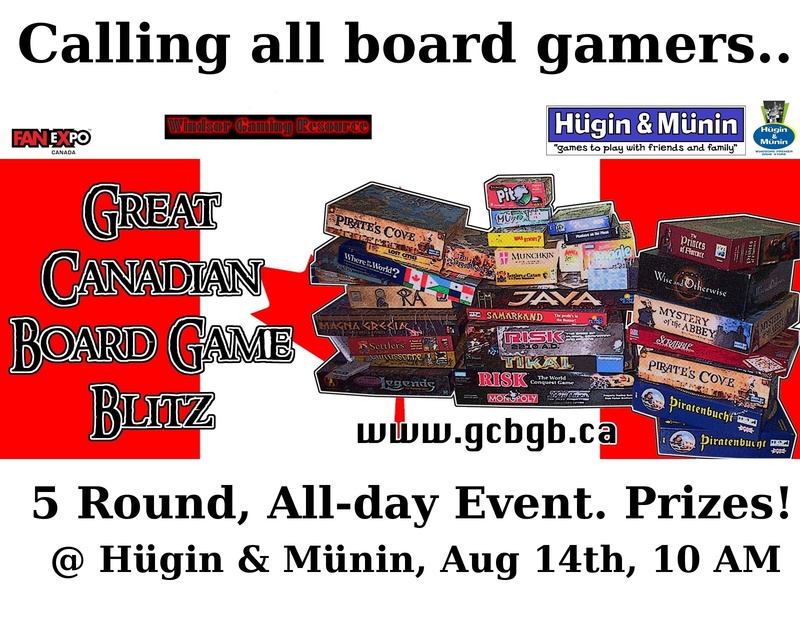 This weekend’s event is the Windsor Qualifier for a circuit of board game tournaments across Canada, the WGR and Hugin & Munin will host this FREE event (w/ prizes) starting at 10am on Saturday at Hugin & Munin, 1664 Tecumseh Rd. E. Windsor. There is NO COST to participate in this event. There will be $50-100 in prizes from for the top-ranked players, depending on participation. The first place player will also receive a free pass to FanExpo for the GCBGB finals in August. What types of games will be played? Do I need to know all the games to play in the tournament? Although this is a tournament, a casual and friendly atmosphere are encouraged. You do not need to know any of the games to play in the GCBGB but knowing them would give you a strategic advantage. The rules for each game will be explained before starting, if needed, and any rules questions during the game will be answered. Where is Hugin & Munin? Hugin & Munin is located at 1664 Tecumseh Rd. E. Windsor. I’d like to thank Hugin & Munin for their generosity in letting us use their store for this event. Please take the time to visit their web site, linked above. Normally we hold these at game conventions, which means it costs at least the entrance to the con. This one is entirely free! Get your gaming on! You can reserve a spot in the event by RSVPing to [email protected] or by visiting their Facebook Event page.